Meet Louise Thompson and her wonderful mare Stahr. Stahr is a half Arab half Mustang born in 1996. Stahr is one of those rare horses that can be taken off the shelf, dusted off, saddled up and then finish in the top ten in limited distance endurance rides. More incredible than Stahr is her owner Louise whom is 67 years young and competing in endurance. Louise is one tough cookie having been bucked off her mare a few times but she dusts her self off and keeps after it! 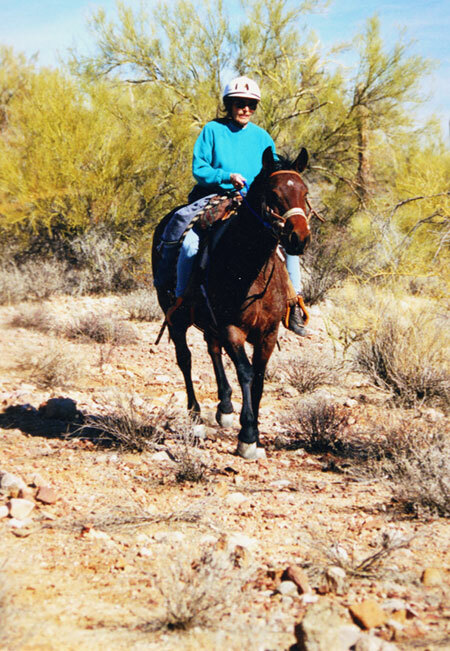 Recently, Louise and Stahr completed their first 50 mile endurance ride in southern Utah! Notice the rocky trail above, barefoot and no boots! Color Country Endurance ride, 2002, 25 miles, 10th place. Color Country Endurance Ride, 2003, 25 miles, 5th place. Davenport Dare, 2003, 25 miles, 5th place. Color Country Endurance Ride, 2004, 50 miles, completion, official results not yet in.